Son of James and Lydia Taylor, of Harle Syke, Burnley. Mrs. Taylor, late of 5, Atkinson-street, Briercliffe, and now of 18, Ada-street, Nelson, has received official news of the death in action of her son Walter (241010, of the 2/5th East Lancashire Regt. ), on November 28th. The sad news came first from an officer, who wrote: - "Dear Mrs. Taylor, - It is my painful duty to tell you the sad news of your son's death on November 28th. He was in the dugout, along with a few more of his comrades, when a shell came and buried them. When we got them out, Walter and two more died soon after. Your son suffered no pain. Another man lived a few hours. They were buried side by side, and little crosses, with their name and number on, were erected. We all miss Walter very much, as he was ever willing and ready to do his share of work." A comrade, who was a stretcher bearer with the deceased soldier, writes:-"He was liked and missed by them all, including the officers, as he was ever-ready to do his bit." Another chum writes: - "He ought to have been spared to come back, for the good services he has rendered to others." Before enlistment, Pte. Taylor was a weaver at Queen-street Mill. He and his brother Alfred both enlisted at the end of September 1914. Alfred was an ex-soldier, who went through the Boer War, and was drafted out in November, 1914. He nobly did his duty until he fell on the 13th May, 1915. Their father died a year ago of a broken heart, through the loss of his first son, Alfred, and anxiety about the other. Official news has been received of the death in action in France on November 20th, of Pte. (241010), Walter Smithe Taylor, of the East Lancs. 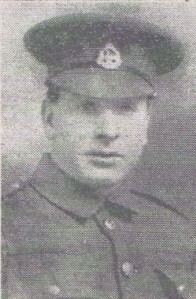 Regt., whose home was at 5, Atkinson-street, Harle Syke. He was aged 23, and was formerly a weaver at Queen-street mill. An officer wrote to the sodlier's mother that Walter and two more soldiers died shortly after being released from a dug-out which was blown in by a shell. Walter was ever-willing to do his share of work, added the fofficer. Walter's brother, Alfred, who served through the Boer War, was killed on May 13th 1915.